Ok, so we’ve all heard the old wives tales our mothers have told us over the years. But what’s really true? Is she right? Did someone just make it up to ease our discomfort? WHAT’S THE DEAL?!?! Below are 10 common beauty myths – DEBUNKED! Was Mom right? MYTH #1: Pluck one gray hair and two more will grow in its place. FICTION: Before you break out the tweezers, it’s important to know that each follicle on your head can only produce ONE hair strand—no matter the color. 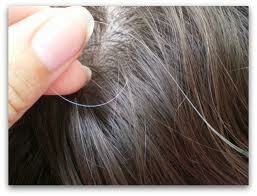 The main difference is that gray hairs tend be wiry, so you see and feel them more once they start growing in. Ask your stylist to add color products to your hair to soften and help those pesky grays blend in. 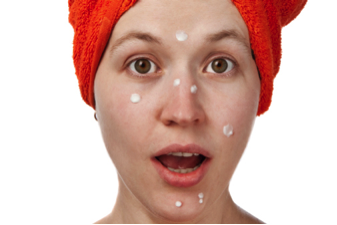 MYTH #2: Products that claim to shrink your pores. FICTION: Unfortunately, you can’t actually shrink your pores (Booooo! )—you are genetically blessed with whatever size they have turned out to be—but even if you can’t reduce their diameters, oil-absorbing mattifiers and salicylic acid-based exfoliant products will help make them look less obvious. Keeping them healthy and clear will make them less noticeable. FICTION: When you shave a hair, you don’t necessarily change the width, density, or color of the hair…but because you cut it at the base (the widest part of the hair strand), it grows out from that point at appears thicker and harder. FACT & FICTION: Waxing rips the hair strand out at the follicle…and after decades (a long time) of repeated injury, you can eventually damage some follicles to a point that hair doesn’t grow back. 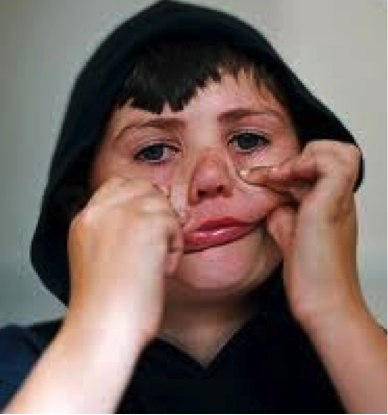 MYTH #5: If you keep making that face, it will freeze that way! FACT: When you are tired and cranky and rubbing your lack-of-sleep or too-much-fun eyes, you won’t necessarily increase your crow’s feet. BUT…your consistent smiling/frowning/squinting/whistling can break down your skin’s collagen and more and more wrinkles will form over time. MYTH #6: Brushing your hair 100 strokes a day will make it shine. FICTION: One hundred strokes are way too much and yes, Marcia Brady was seriously misinformed. If you tug on your hair that often, you’ll ensure a ton of damage to your locks by breaking many of the strands. Gently brush your hair here and there to make your hair shinier by stimulating and distributing your scalp’s natural oils down the shafts and flattening the cuticles to make them reflect more light. MYTH#7: Tanning will get rid of pimples. FACT & FICTION: While some sun exposure may help pimples get better temporarily (by stimulating “porphyrin”—a chemical that destroys the acne causing bacteria), this form of acne relief is not recommended. However, if you are soaking in too many rays, you might actually reverse the effects. Often, sun-soaked skin will dry out and become damaged, which inevitably tells your body to produce more and more oil—thus creating more breakouts. Not to mention the potential risks of skin cancer and premature aging that sun exposure increases. Make sure to include an SPF product to your daily skin regimen. FACT & FICTION: Many toothpaste brands contain menthol, which can help dry out a pimple. But please don’t run and apply a Colgate face mask—many toothpaste ingredients can cause skin irritations. If you are in a pinch and don’t have other pimple fighting products, a small dab on your blemish could just do the trick! FACT: When you are dreaming away with your face buried in your pillow at night, you are putting lots of pressure on your fragile skin for many hours in a row—and over time, your skin’s elasticity will be increasingly less likely to snap back. If you tend to sleep on one side of your face, you will typically show more wrinkles on that side than the other. Learning to sleep on your back can help your skin a bit, but wearing a good sunscreen every day will make the biggest difference. 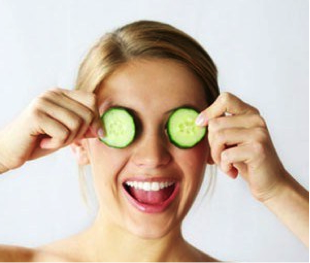 MYTH #10: Cucumbers can help de-puff your eyes. FACT: The coldness of refrigerated cucumbers restrict blood vessels and thus reduce eye swelling and puffiness. Anything that’s cold and easily applied to your eyes will do the trick and you only need to apply for a few minutes to do the trick.